Women's Rights and Women's Lives In France 1944-1968 explores key aspects of the everyday lives of women between the Liberation of France and the events of May '68. At the end of the war, French women believed that a new era was beginning and that equality had been won. The redefined postwar public sphere required women's participation for the new democracy, and women's labour power for reconstruction, but equally important was the belief in women's role as mothers. Over the next two decades, the tensions between competing visions of women's `proper place' dominated discourses of womanhood as well as policy decisions, and had concrete implications for women's lives. 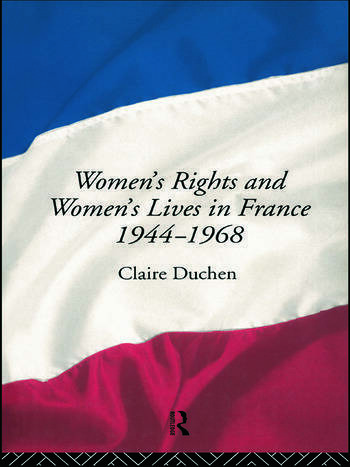 Working from a wide range of sources, including women's magazines, prescriptive literature, documentation from political parties, government reports, parliamentary debates and personal memoirs, Claire Duchen follows the debates concerning womanhood, women's rights and women's lives through the 1944-1968 period and grounds them in the changing reality of postwar France.